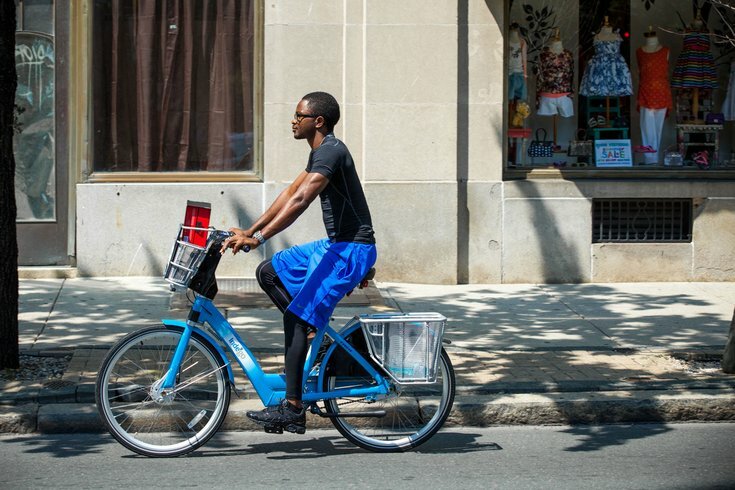 A man rides an Indego bike in Rittenhouse Square. This St. Patrick's Day get a little exercise in before toasting the holiday. The Pennsylvania Environmental Council is hosting a bike ride down Spring Garden Street that starts at Eakins Oval and ends at Yards Brewing Company. The ride begins at 5:30 p.m. and will last approximately 45 minutes. Along the way, there will be brief stops to discuss the plan for the Spring Garden Greenway, a city sidepath project. The completed design will be a safe route for bikes. Those who don't have their own bikes are encouraged to rent Indego bikes from close-by bike stations for the group ride. While the event is free, registration is required.